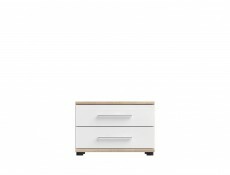 Belinda white bedside cabinet with 2 drawers in Sonoma Oak finish with White fronts. Belinda offers high standard drawer runners to ensure smooth movement and high stability drawers. - The soft tones bring the interior of the bedroom warm and atmospheric mood that will promote relaxation. 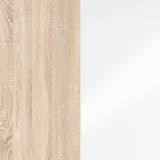 - Combining natural colour sonoma oak wood with pure white is a proven duo, who always work wonderfully together. - Comfortable headboard provides a comfortable space for a restful night's sleep. - The headboard is a stable support for your back and prevent slipping cushions on the floor, and additionally protects against dirt on the wall. - Spacious, four door wardrobe can be a great advantage when keeping all of your possessions organised. 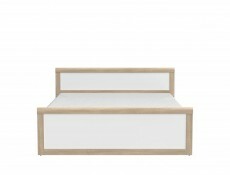 - Set Belinda is a universal proposition bedroom furniture. The compact collection makes it ideal for smaller rooms in which to make best use of the available space. - The soft tones bring the interior of the bedroom warm and atmospheric mood that will promote relaxation. 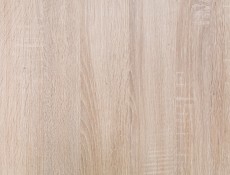 Combining natural colour sonoma oak wood with pure white is a proven duo, who always work wonderfully together. - King Size bed with headboard provide a comfortable space for a restful night's sleep. The headboard is a stable support for your back and prevent slipping cushions on the floor, and additionally protects against dirt on the wall. - Compact night stand is an integral part of the bedroom. Its small form ideally suited to small spaces. At your disposal you have a table top and 2 drawers, which conveniently store any small items. - Spacious wardrobe helps you to keep an organised room. Inside, you will find a space with hanging rail and placed just above is a high shelf. 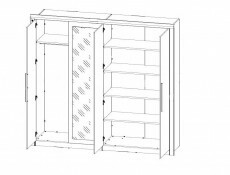 The right segment of the cabinet has 4 shelves which are half the width of the furniture. 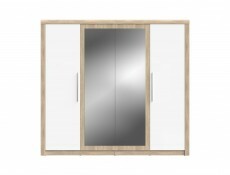 - The advantage of these wardrobes are the large, mirrored fronts. Their surface perfectly reflects light, making the room seem brighter and more spacious.